Look like an Egyptian goddess in this beautiful Queen of the Nile Cleopatra costume! 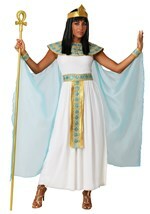 The costume features a black polyester dress with a light blue trim around the bottom of the skirt. Two straps in the front of the dress tie back around the neck while two spaghetti straps can be used for added comfort. Two arm cyan and gold arm drapes are included and feature elastic arm and wrist bands covered in gold sequins at both ends. The matching headband is also covered in gold sequins. Strands of beads drape down over both sides of the face and a red plastic jewel is attached at the front while a small blue jewel hangs from below. The collar is made of gold fabric and Velcros in the back. 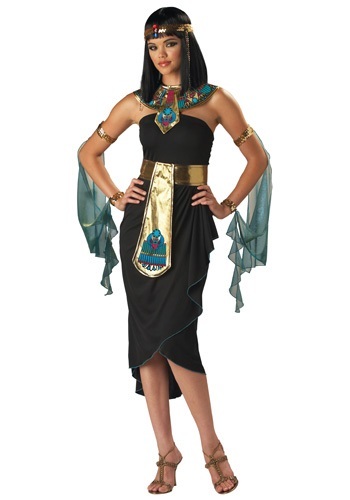 An Egyptian-style print runs around the circumference of the collar. The apron belt is gold in color and Velcros in back. A colorful scarab design adorns the bottom of the apron flap. 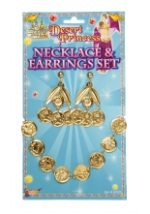 Add some of our gold costume jewelry for a royal touch!